The only way to get to Kwethluk is by air. Most of my customers are based in rural Alaska, which is very far from the nearest branch. I serve an area as big as the state of Alabama. My customers live over 100 miles away from the nearest bank. . The uniqueness of the job is to be able to understand the customer I have. My customers are tribal and native Alaska businesses that are very unique in structure and needs due to location, due to traditional way of living. This is a pike. They fish it in the spring and the fall. We have to go to them. We have to reach out to the customers and really understand who they are. Our people have been here since time memorial, and we have histories that are passed down orally, and our first people were up in the Kwethluk mountains, and they first moved here probably 1900’s. We live off the land and the waters, hunting and fishing, that’s our supermarket out there. The only way to get there is either by boat, or by air. I’ve even driven on a frozen river to get to my customers. When I first started growing up here in this village it was less than 500 people, and I’ve seen technology change our community from our traditional values, our cultures, to the 21st century. You have to live in two worlds, the working world and the subsistence world to feed our families. This is the most critical component is getting our fuel in for the winter during the fall months. The barge do bring in gravel, lumbers, during the summer months. We help finance the fuel purchase for these communities. The fuel is crucial, because fuel provides gas for boats, for snow machines. Heat for home and electricity for the winter months. Anything else we can assist with, with Kwethluk. I think everything is working well right now. Merchant services, access to terminals. Wells Fargo helps our people survive the 21st century with all the critical needs of our company. Fuel, all the services that we rely on in order to survive throughout the, all winter, fall. And then this here during the summer is what to eat, you know — cut. Will the guys go fish — cut? Raising my family here, being married to a native Alaskan, I feel very connected to this land. I feel very connected to the people that, that are here in rural Alaska. I feel that my role is to be the bridge to connect between the traditional world and the modern world. The summer season in Alaska offers a small window of time for rural communities to restock the supplies they need to survive the long, harsh winter ahead. With the rivers no longer choked with ice and daylight lasting nearly 24 hours, barges bring these remote towns everything from raw building materials to oil for heating homes and fueling vehicles. Nili Sundown often takes a small, single-engine plane to reach her customers in Southwest Alaska. Iconic Alaskan images with big mountains and large lakes define much of Bristol Bay. Aleknagik Lake and the Wood River, in the Bristol Bay region of Alaska, have been used historically to base summer fish camps. Subsistence activities by indigenous people in Alaska is done to collect, cure, and store seasonal food to prepare for the long winters. Many residents of the village of Aleknagik, a federally recognized Yupik Alaskan Tribe, participate in commercial and subsistence activities on the Bristol Bay of coast of Alaska during the summer. Most families depend to some extent on subsistence way of life. Salmon, freshwater fish, moose, caribou, birds, and berries are harvested. Bristol Bay water is the home to the world’s most abundant Sockeye salmon fisheries as well as strong run of chums, silver, and king salmon, each occurring seasonally. Bristol Bay sockeye salmon fisheries saw a record return in summer 2018 — 62 million Sockeye, with over 7.5 million returning to the Wood River. Residents along the Kuskokwim River are gathering driftwood to heat their homes during the river breakup. The Kuskokwim River, 702 miles long, stretching through Southwest Alaska, is mostly frozen in the winter. During breakup, the massive power of the moving ice sweeps in trees from the edge of the riverbank. In true traditional fashion of constant preparation for the next season, residents begin collecting firewood from the Kuskokwim River as the warmest part of the year begins. Soon, subsistence fishing for salmon will take place, and provides a staple of the fresh food to the indigenous Yupik and Athabaskan people’s diet. There are numerous glaciers in Lake Clark Pass, of Southwest Alaska, that provide a window of many season of snowfall, compressed into a river of ice that flows from the top of the mountain to the valley below. On a family trip from Bethel to Anchorage in a small aircraft at 4,500 feet, provide a scale that shrinks your sense of self, even from the relatively high altitude. Flying through this narrow passage of untouched land is to travel back in time. The Alaska Range is the northern most extension of the immense mountain range in western North America, and the home to the highest peaks of North America. Few symbols define Alaska as well as the brown bear. From the famed Kodiak brown bears to the many viewing sites along southwest Alaska. Two sites stand out as tourist bear havens as McNeil River Falls and Katmai National Park. 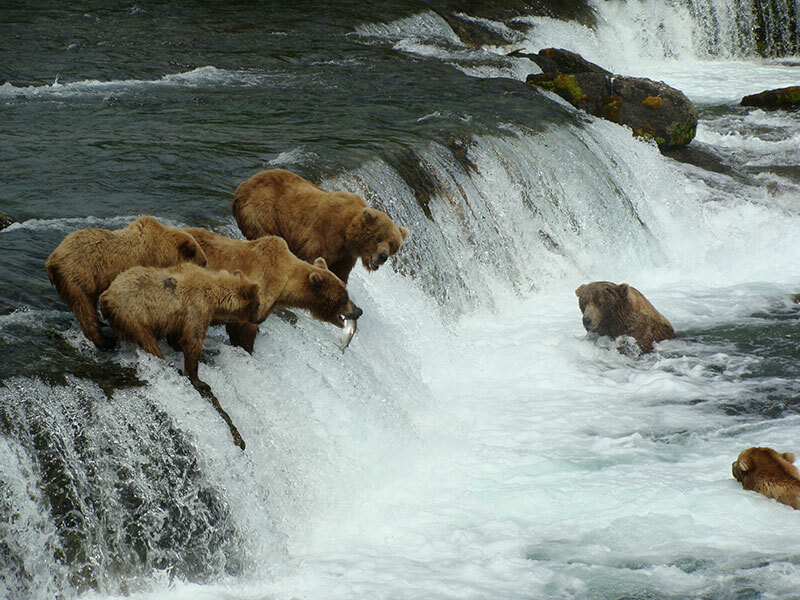 Near King Salmon, Alaska, in the Upper Falls of the Brooks River in Katmai National Park, mama bear teaches her young cubs how to catch a meal of Salmon at Brooks Falls. Millions of salmon return to spawn to the streams of Bristol Bay every summer. The park is known for the many brown bears that are drawn to the abundant salmon in Brooks Falls, and offers viewing platforms for visitors to observe these fascinating animals. About 2,200 bears are to inhabit the park each summer. There are more bears living in the park than all the people live in the Alaska Peninsula area, and this is the largest concentration of brown bears in North America. This is a photo of subsistence hunters from the Village of Kwethluk retrieve a caribou near the Johnson River, a tributary of the Kwethluk River, in the Kuskokwim Delta of southwest Alaska. Alaskan indigenous people have relied upon the traditional harvest of wild foods for thousands of years, and have passed this way of life, its culture, and values down through generations. This photo was taken while my husband and I were hunting caribou, and we realized that there is a group of hunters shooting on the same caribou herd from the other side of the hill. The young hunters did not realize that they actually shot a caribou after all and were heading back to their boat. We ran to the edge of the riverbank and flagged them down. They were so happy to know that they will return home with a successful harvest. This photo was taken after a boat trip with my mother in-law and family to pick berries. While boating, the berry-pickers filled the air with excitements and anticipation for the taste of the first fruit of the season. In this endless tundra landscape, in peace and tranquility, in almost meditating fashion, the people here are connected to the land and blend in it. Carpet of salmonberries covering the tundra in July near the Village of Scammon Bay, on the Yukon Kuskokwim Delta in western Alaska. Salmonberries are a local favorite — provide nutrition, medicinal and cultural values essential to the indigenous Alaskan people who live in rural Alaska. Families will travel by boats and camp outdoors to pick gallons of the honey-like flavored berry to store for use during the long winter months. During the summer months, the rich tundra produces greens, more than five kinds of berries, tea, and moss to all the livings off of it. Camping in the winter never has to be uncomfortable. The winter temperatures drop to minus 15 Fahrenheit on many cool, clear nights, but falling asleep and waking up in a warm tent makes this easy for even novice winter campers like me. Many families enjoy the outdoors air on a crisp, cool night under a canopy of celestial wonders while hunting, traveling, or simply to remember that life does not end with the passing of summer. Winter provides remarkable landscapes and opportunities for many families to live their life to the fullest in Alaska.